Once people begin to understand just how using a VPN benefits them, most are quick to look to sign up for one. But for many people, this is where the problems start. Because choosing the right VPN for you can be like looking for a needle in a haystack, especially if you are not particularly tech savvy. This is where VPNCompare.co.uk comes in with our independent VPN reviews which offer the comprehensive breakdown of the pros and cons of hundreds of VPN providers. But it has become clear that many readers are still struggling to make that final choice. We have countless people asking us to help them make a decision between two VPN providers they just can’t separate, which is what this article is all about. Because two of our most popular providers are NordVPN and VyprVPN. But for many, making that final choice can be tough. So, in this article, we are drawing a direct comparison between the two to help you make a judgement call over which is the better provider for you. 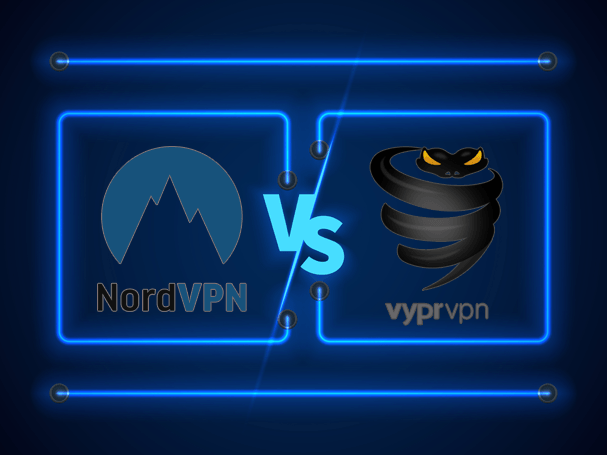 It’s NordVPN vs. VyprVPN. NordVPN has been around for quite a while now and in that time it has built a pretty solid reputation for itself off the back of a reliable service and affordable pricing. Dedicated clients for Windows, Mac, Android & iOS. Simple and cost effective pricing structures. More than 700 servers located in more than 58 countries. A guaranteed 30-day money back offer. Provision of a free 3-day trial. A range of additional features. A quick and efficient Live Chat support service. Connection speeds can be slow at times because of their strong security provisions. VyprVPN is another name which has been on the market for a long time. Owned by Golden Frog, they are renowned for their simple and effective service and their longevity suggests they are doing something right. Simple software both for desktop and Apps. Windows, Mac, Android & iOS all catered for. 700+ Servers available in more than 70 locations across the globe. Good encryption including a 2048-bit RSA key. Their connection speeds are not the quickest. So as you can see it is a pretty close thing between the two in our reviews, which makes it perfectly understandable why people are on occasion struggling to choose between the two. But how do they compare when we take our five core criteria that most VPN users are considering, and compare them directly? Keep reading to find out! It’s a fact that economics will determine the choice of VPN provider for many people. But the cheapest service is not always the best value for money. For NordVPN, monthly prices range from $11.95 for a one-month contract to $5.75 p/m for a one-year contract. VyprVPN’s structure requires a little more thought. Their “VyprVPN” package is priced at $9.95 per month or $5 p/m for a yearly package. Their second package “VyprVPN Premium” costs $12.95 per month or $6.67 if taking a year subscription. For simplicity, there is only one winner under this criteria, however VyprVPN is cheaper. On security, NordVPN offers four VPN protocols; IKEv2/IPsec, PPTP, L2TP/ IPSec, and OpenVPN. They also offer additional features including Double Encryption, which for certain connections, will route data through two servers and encrypt it at both. Privacy wise they are great too, being based in Panama and also offering the option of shared IP Addresses as well as various other features. VyprVPN’s 256-bit OpenVPN connection uses AES-256-CBC initialized with a 256-bit key. The control channel uses TLSv1, cipher TLSv1/SSLv3 DHE-RSA-AES256-SHA with a 2048 bit RSA key. They also offer PPTP and L2TP/IPSec as well. Their privacy policies are clear too and their no logs policy is guaranteed. If you opt for their higher tier package then you also get a bonus protocol called Chameleon that will allow you to bust through restrictive internet regimes such as in China or Iran. But their policy is not to allow copyrighted material to be downloaded or distributed through their service, which is likely to put off some potential subscribers. NordVPN has servers in more than 700 locations across more than 58 countries. They have all the most popular locations well catered for as well. VyprVPN also has more than 700 servers available for users too, but with theirs based in over 70 locations worldwide. Therefore, whilst both are likely to have enough server locations to satisfy everyone, on sheer quantity, VyprVPN just edges this one. NordVPN is compatible with all the main operating systems and offers user-friendly clients for all. They also allow up to six simultaneous connections with every subscription. VyprVPN also serves all the major operating systems with easy-to-use apps and desktop clients. The number of simultaneous connections available depends on the package you subscribe to though, with the cheapest offering just 3, whilst the most expensive permits up to 5. NordVPN offers a range of support options including a live chat service which has proved to be both quick and helpful for us. Queries can also be submitted via an email service and also on their Facebook page. As for VyprVPN, they were one of the first providers to offer the live chat facility which is so valued by users, and with an efficient email ticket service as well, both providers have this one covered. So, the verdict is in and in a head-to-head comparison, the results of our individual reviews are borne out. NordVPN has a clear advantage of VyprVPN in many categories. Whilst VyprVPN offers a similar support service and has just a handful more server locations available, NordVPN pricing is easier to understand and offers clearer security and privacy provisions. Both providers offer a good service and it was a tough call but if you are unsure which of these two providers to opt for, we would recommend you go with NordVPN every time.